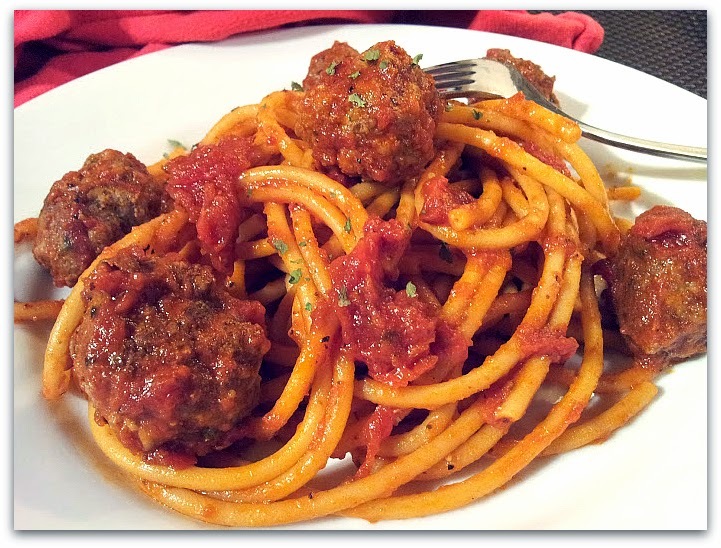 I know, I know...does the world need another recipe for spaghetti and meatballs? Google alone had over 1,880,000 results when I checked this morning. But I really, really like my version...a combination of my Mom's recipe with my tweaks. And it occurred to me that, after six years of blogging, I have never shared this beloved, comfort-food-at-its-best, dish at Napa Farmhouse 1885. My mom's meatballs are very similar to mine but she cooks her sauce all day. She starts in the morning...lets it simmer all day...and she does not finish the meatballs in the sauce. She uses the oven method. She cooks the pasta, adds meatballs (she makes really big ones so people normally need just 1 or 2) and she then ladles the sauce over everything. 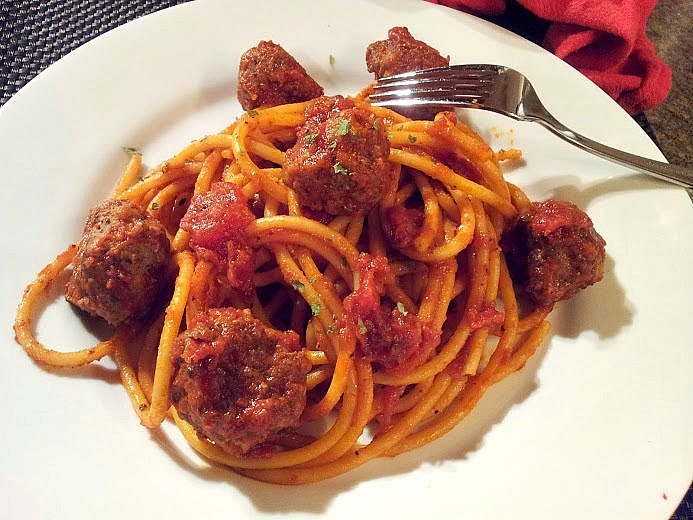 I like the fresher tasting, quicker version sauce to balance out the "meatiness" of the meatballs and I really like finishing the pasta in the tomato sauce. When I make my mom's sauce (will share one day) I either keep it vegetarian or make it a meat sauce by adding ground sirloin at the beginning and let it simmer all day with the rest of the ingredients. My grandmother's sauce was different from both my mom's and mine. I love the way the generations adapt but honor the family recipes. My grandmother's, my mom's and my sauce recipes are all a little bit different...but equally delicious. Give my version a try and please let me know what you think in the comments section of this post. And, while you are at it, tell me how you make spaghetti & meatballs? Use the skillet from making the meatballs...You want all the flavor from the oil and bits of meat. Add the additional tbsp of olive oil and heat over medium high heat. Add the onion and saute until soft and translucent, about 5 minutes. Add the garlic, saute for an additional minute (do not let garlic brown). Add the tomatoes, parsley, wine, pinch of salt and cooked meatballs. Bring to a boil, reduce heat to low and simmer 25 minutes, stirring occasionally. Meanwhile, bring a large pot of water to boil. Season with small handful of salt. Add the pasta and cook for 1 minute less than package directs. Drain the pasta and add to the cooked sauce. Stir in and cook an additional minute. Taste and adjust seasonings if necessary. Serve immediately with plenty of parmigiano-reggiano for topping the pasta. Add all ingredients to large bowl and, using your hands, mix just until incorporated. Do not over mix. 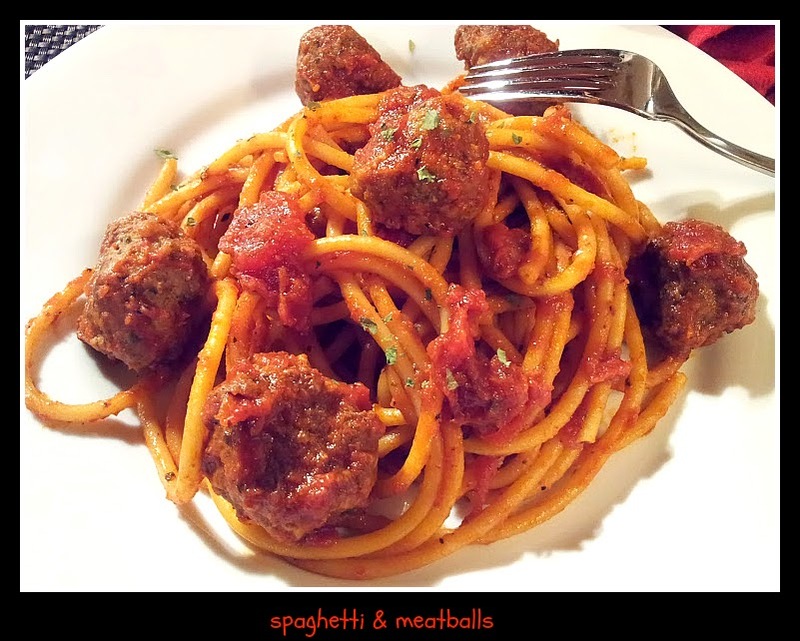 Use a spoon or ice cream scoop to create 28 meatballs, about 1 1/2 inches in diameter. Roll lightly between your hands to form the balls. It is "Clean Out the Pantry Night" week at Food Network's Sensational Sides roundup. Check out the other delicious sounding recipes from my blogger friends. Do you have a favorite pantry recipe? Feel free to share in the comments section or link to your blog if you have one. Recipes will be posted at noon on Thursday.